In October 2006, we corrected a bug in the bias error estimates for CRUTEM3 distributed from this website. Note that the best estimate values are unchanged, the effect of the bug was to make the error ranges slightly too big. 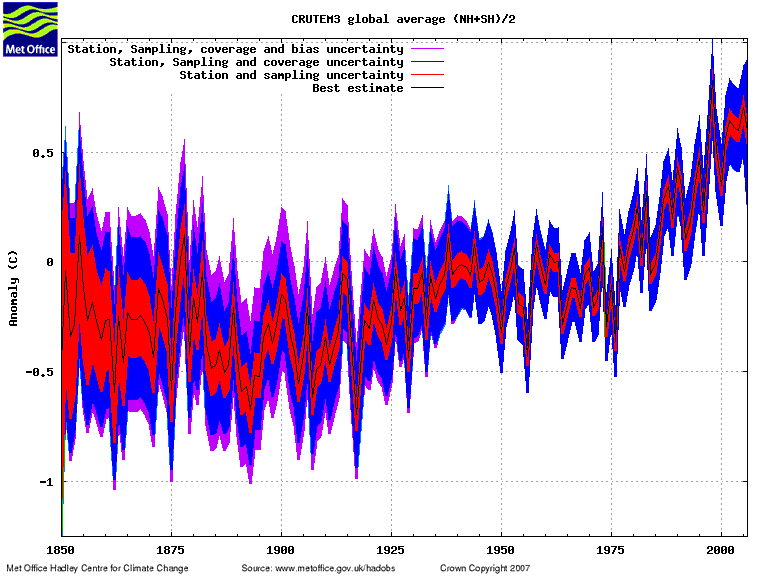 When the CRUTEM3 dataset was developed, the uncertainty due to possible biases arising from changes in the environment of the stations caused by increasing urbanisation was assessed to have a 1 sigma value increasing from 0 in 1900 to 0.005C in 1990, and extrapolated linearly after that. (For details, see the paper). Unfortunately, when calculating the error fields and time-series provided on this website we used an urbanisation uncertainty estimate that was twice this size. This caused a slight overestimate in the total error ranges; the two figures below illustrate the difference. If you downloaded CRUTEM3 uncertainties data from this site before October 2006, please download replacements. Note that the best-estimate data is unaffected, only the uncertainties have changed. We're sorry for this error, if you want any further information, please contact us. This change also effects HadCRUT3.